On a whim, we headed out for lunch to Creams Cafe in Stevenage Old Town. I’d been meaning to try it for ages and today was the day. Creams Cafe is styled like an American diner. 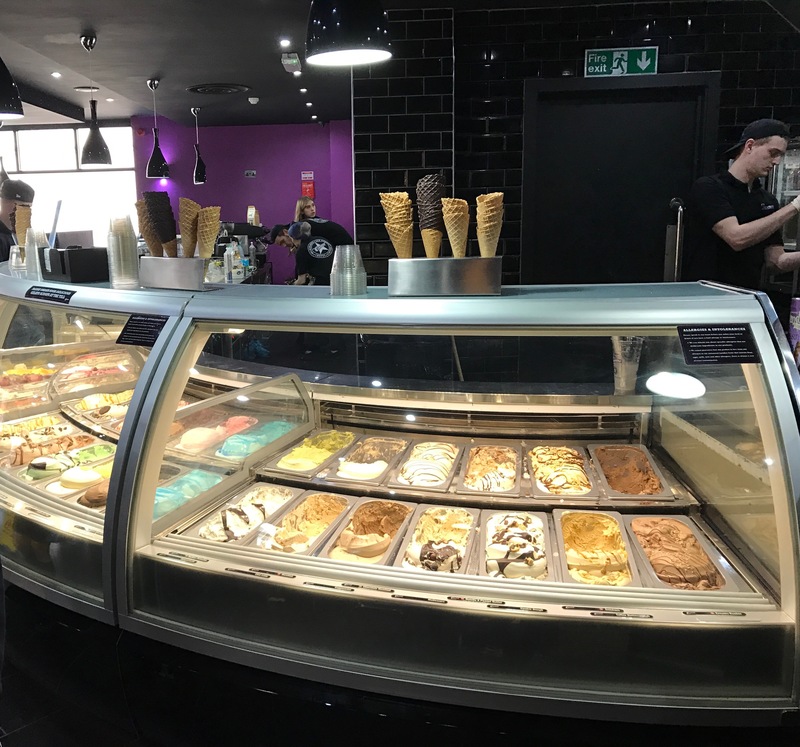 A long counter proudly displays the gelato flavours and there are plenty of spacious, comfortable booths. There is a lot of sparkle, including a big, shimmery disco ball at the centre. If you have a sweet tooth, this is the place to go. There is no savoury on the menu – expect huge portions of crepes, waffles, ice-cream sundaes, gelato and milkshakes, with seemingly never-ending combinations of sauces and toppings, including Smarties, Oreos, strawberries, and chocolate drops. If you can’t find your perfect combo, you can order a plain crepe and then add your own choice of toppings. Armed with your table number, you head up to the counter to order. Service was quick and efficient, and our food arrived speedily. The food is very tasty but they are mega portions. I struggled. I would highly recommend sharing, as there was simply too much for one person. Two plates between three would be plenty. This is a great place to come for a sugar hit, and there is loads of choice, but I would recommend heading here after a meal for dessert, rather than for lunch, due to the fact that there are no savoury options available. If you’re taking the kids, they’ll love it, for obvious reasons. Check out the Creams Cafe website for more information.